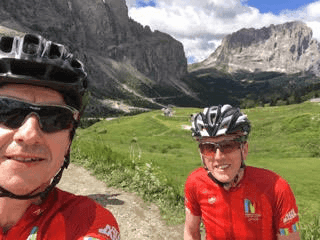 Maratona Dles Dolomites 7th July 2019 in Lavilla, Italy -Limited Places Available! 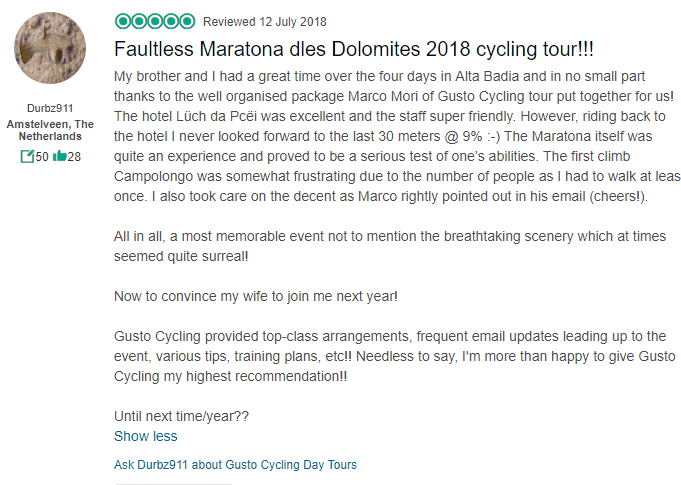 I am pleased to confirm the organisers of the Maratona Dles Dolomite have provided Gusto Cycling with guaranteed places for the event , these places are priceless! !….last year 36,000 entered and only 7,000 were accepted..so this is a real coup. 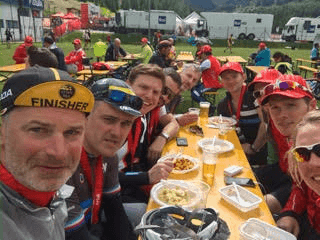 This is the most beautiful and stunning 1 day cycle event in Europe with just the most amazing mountain climbs and descents in the heart of the Dolomites….The event takes place on the 7th July 2019…. the accommodation packages for 4 nights with guaranteed registrations are available in apartments or hotels in La Villa where the start of the Maratona takes place. La Villa is just 200m from the start of the event in addition self catering apartments are available in the fashionable village of St Kassian 3km away, the finish at Corvara is just 4km from La Villa. I can offer Guaranteed entry for the Maratona dles Dolomite event and 4 nights in a variety of hotel and self catering apartments beautifully located in La Villa. FYI – I have secured a large modern chalet with 4 apartments which I have used for the last 8 years with the family Ploner see details below..In addition I have all the apartments at Residence Lo Ro in St. kassiano (3km from La Villa), Hotel Ladinia in La Villa and hotel Luch da Peci. FYI – The town of La Villa is where the start of the event takes place and is only 4km from the finish of the event in Corvara. There are 4 flats all in one building with secure garage for bikes…it’s located just outside La Villa (very small town) 200 metres from the start of the actual event… the race finishes approx 4km in Corvara so after the past party you have a nice 4km descent back to your accommodation….This is an excellent location when you realise you have to be at the start line by at least 6am in the morning!! 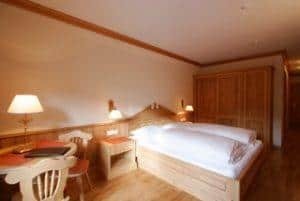 All the rooms are all doubles….they don’t have twins in the Alta Badia Region…but the beds are big enough..the beds actually have separate mattresses and separate duvets see picture below hence they are almost twins!! 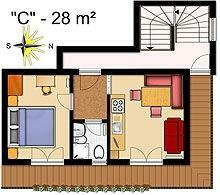 Type “A” Apartment – Accommodating : 4 people – Size: approx 60 m2. located ground floor. 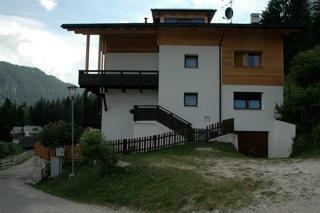 The new apartment will have 2 double rooms, 2 shower rooms with toilet and 1 living kitchen..
Luch Da peci offers a choice of hotels and apartments in the beautiful village of San Cassiano – arrival Thursday 4th July 2019 – 4 nights self catering with guaranteed registrations ..
San Kassiano ((1537 m.s.l. ), at the foot of Mt. Lavarela, Its upmarket village offer charm, well-being and gourmet cuisine and the pedestrian area is perfect for shopping and peaceful atmosphere. A double bedroom, a living room with comfortable double sofa bed, dining table, kitchenette with dish washer, a big bathroom, the living room and the bedroom are adjoining rooms, but, in order to guarantee a better privacy, both of them have a separated exit which connects each room to the bathroom. The Bathroom are from the Comfort Rooms. 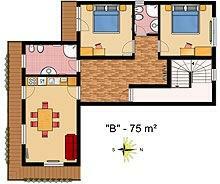 The Bedroom is from the Superior Apartment ( for 2 Person) and Living room is form the Big apartment 60 m2. Every apartment is equipped with the following facilities and furniture: telephone, satellite TV, locker, dish washer, hair dryer, wooden floors, Tyrolean style custom-made furniture, precious and refined hangings. Balcony with sun beds and clotheshorse. Bed and kitchen linen. The apartment is cleaned daily, except on Wednesdays and Sundays. On request (and at bakery’s price) every morning we offer fresh milk and bread. You can visit website: http://www.luchdapcei.it/en/ for more information. This apartment is 37 m2 . 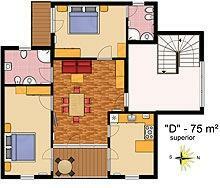 Big bedroom, dining table, balcony, kitchenette with dish washer, big bathroom with shower and toilette. Price for this apartment £559 per person based on 2 persons sharing the apartment for 4 nights accommodation with breakfast and guaranteed registrations for 2 persons. In the beautiful village of San Cassiano for consideration – arrival Thursday – 4 nights self catering with 1 or 2 guaranteed registrations ..
FYI…San Kassiano is located 3km downhill to La Villa where the start is…and 7km from the Finish at Corvara which is 4km from La Villa. Prices for Studio Apartment B 1 bedroom apartment 30m2 – £485 per person this is based on 2 persons sharing the apartment for 4 nights accommodation and guaranteed registrations for 2 persons. Prices for Apartment C 1 x 1 bedroom apartment 40m2 (only 2 available) – £509 per person this is based on 2 persons sharing the apartment for 4 nights accommodation and guaranteed registrations for 2 persons. Prices for Apartment C 1 x 2 bedroom apartment 35m2 (only 1 available) – £509 per person this is based on 3 persons sharing the apartment for 4 nights accommodation and guaranteed registrations for 3 persons. 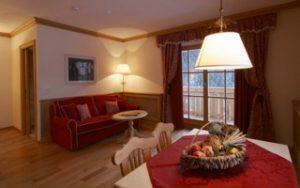 For 4 people it is £469 per person. The 2nd room for the 3/4 person is a bunk bed – see website . Prices for Apartment D 1 x 2 bedroom apartment 60m2 (only 1 available) – £509 per person this is based on 4 persons sharing the apartment for 4 nights accommodation and guaranteed registrations for 4 persons. You also access to free wellness and indoor swimming pool! *Excluded from the prices local tax. (except for children under 14 years). Stay in Hotel Ladinia 3 star owned by the family Varallo located right in the centre of La Villa where the event actually starts….in fact the start is pretty much outside the hotel!! Located in a wonderful panoramic position in the center of La Villa Hotel ideal for a relaxing holiday in the beautiful Dolomites. – Arrival Thursday 4th July for 4 nights accommodation on bed and breakfast & half board basis (drinks are extra) with guaranteed registration for each rider. Thanks, it was a really special event and thankfully a good day, and the accommodation was perfectly placed for the Maratona and everything else (although I wasn’t looking forward to the cycle back to the apartment after the event). Thanks for organising the trip to the Maratona again this year as usual the organisation by yourself and the Maratona Committee was fantastic, the weather this year was perfect and the day went really well the course was as stunning as ever and atmosphere on the day was terrific with TV helicopters, medical and mechanical support and great food stops. The atmosphere for the week was fantastic with thousands of cyclists filling the roads and cafes there was a great buzz in Corvara. 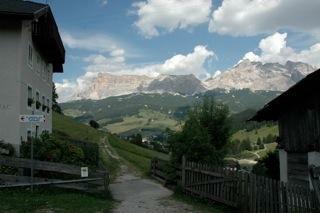 We stayed on after the Maratona and had a great week walking in the mountains using the excellent ski lifts. Looking forward to next year and hopefully a sub 8 hour long course. Thanks once again for all the information before we went and speak soon…. Many thanks for sorting out the voucher at such a late stage . 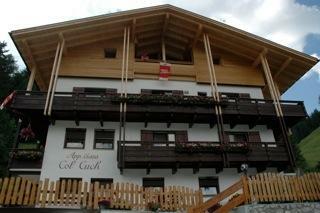 The whole experience was very enjoyable .Casa Col Cuch was in a beautiful location with superb views. The apartment was spotlessly clean. Having ridden in the etape last year , we were very impressed with the reception that we got from the maratona organisers. We also thought that the ‘gift bag’ presented to us was very generous with free gilet and cycle top etc. 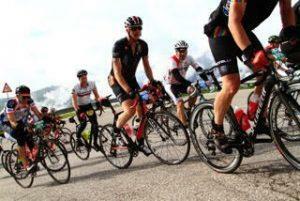 There was also a great ‘cycling buzz ‘ in the villages on the Sat and Sunday . I would like to go back but haven’t decided for definite. 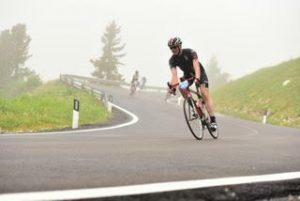 I would wholeheartedly recommend your company to any one who is thinking of competing in the Maratona. 12th July 1987 – A unique route of 175 Km, with no fewer than seven Dolomite passes to cross; 166 fearless spirits of the bicycle that with great courage and fair play struggle to reach the coveted finishing-line: this was how the fascinating adventure of the Maratona dles Dolomites began, attracting year after year an increasing number of fans, to become one of the most important amateur cyclist events in the whole of Europe. Conceived as part of the tenth anniversary celebrations of the Alta Badia-Raiffeisen Cycling Club, its organisers certainly never dreamt that they had created an event which in such a short period of time would have become one of the most important annual events in the Alta Badia valley, attracting thousands of fans, many of whom enthusiastically take part every year. The great success of the Maratona dles Dolomites is certainly based on the splendid setting of the Dolomites, the striking routes that follow legendary runs where great champions have written a rich and glorious page in the history of cycling. The great organisational effort that involves a whole community with the specific aim of presenting a high level and smoothly organised competition capable of coordinating such a high number of competitors, must not be forgotten. Seven thousand cyclist have taken part in Maratona dles Dolomites over recent years, divided into the various categories and routes offered. One of the reasons for the great satisfaction that encourages us to continue despite all the difficulties, is the enthusiasm and friendship that we find in all the contestants, who every year create not only a competition but a celebration of sport, where it is especially the desire to prove oneself against the magnificent surrounding scenery that remains alive. We’ll definitely sign up again next year. 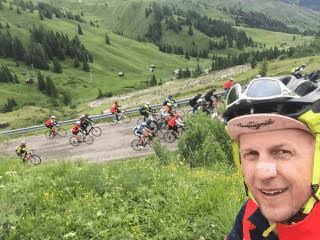 Hi Marco, The Maratona was stunning ,views breathtaking the organisation was excellent.The registration was busy but proceeded quite smoothly,your advice on documents really helped. The rider goodies and kit are very generous. The ride itself is amazing,yes it’s very busy for the first 2 passes and I did what you said and was one of the last out of the blue pen,and took it easy,I certainly could have gone faster the first 1/4 ,so would have broken 8 hrs, but it’s not about a time! 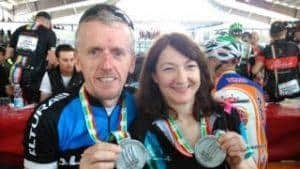 I did my first big sportive the Marmotte last year and this is better organised,the food stops I was told were a bun fight there so I went with a company who had their own stops. 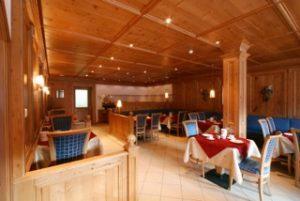 The hotel was really great,food, service and location perfect. And very cosmopolitan in terms of guests,we loved it. Finally I went with your company Gusto Cycling because you answered my early email quickly and concisely. However from our point of view the information beforehand and in LaVilla was fine so that was no problem. All in all great and would do it again. And I will remember passo Giau!!!!! Just wanted to say thank you for all your help. The whole group had a great time and we all managed to complete our distances safely. It has been a weekend to never forget. I would definitely recommend to others. Who knows we may even do it again, but it is a bit too soon for that! Perhaps when the stiff legs, back and behind have faded. We had a great weekend. Really enjoyed the race and the hotel was fantastic. Thank you for setting up. Everything worked really well. Location and facilities were great. Advance info was very informative. Difficult to think of any improvements. It has been a great event. Accommodation, location, Organisation and even the weather were perfect. Thanks again. We are looking forward tone to year! I’ve put the following together which I hope is suitable for publication on your website. It is my real pleasure to endorse you and your company so absolutely. 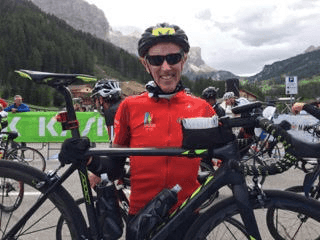 “This was my first year of doing the Maratona dles Dolomites. I decided that I didn’t want the uncertainty of entering the lottery for a place and was really fortunate to stumble upon Gusto Cycling and in particular, Marco. Marco could not have been more helpful. The package I took involved 4 nights stay in San Cassiano which is just 4 km downhill from La Villa (which is the start point of the Maratona). The accommodation was just perfect. It had a balcony looking out to the magnificent Dolomoties, a kitchen diner and a smart bathroom with shower. I was really surprised to find that the room was cleaned throughout our stay. San Cassiano is a wonderful village with some great restaurants and is at the foot of the climb of Passo Valparola (on the Maratona you descend the Valparola in the opposite direction and go right past San Cassiano). I have already told Marco that I’d like to book through him to do the Maratona next year. My only reservation in writing this endorsement of Gusto is that it may mean that I am the unlucky one who misses out on a place at the Maratona because, quite rightly, Marco will be inundated with requests for the brilliant maratona packages that he offers. If that does happen i’ll be incredibly sad but it will be your gain to obtain a place and accommodation through Gusto. The event was fantastic. Both Matt and I said it was the best day we had had on a bike, ever! The organisation was fantastic, especially the e mails and text messages that were sent on a regular basis. We were e mailed photos and videos the next day, which was great. 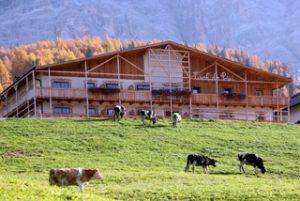 The accommodation was fabulous – with an amazing view from the balcony. The apartment was equipped with everything we needed, which meant we could eat in on a couple of occasions. It was very modern, comfortable and very very clean! The garage facilities were excellent. 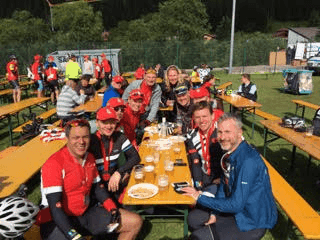 We had a great time…The Maratona was a fabulous event…Thought the accommodation was good- fabulous location and perfectly positioned for the Maratona and to be caught up in the pre and post ride atmosphere. Sally C.